France is supposedly all about liberté, but in fact, everyone is really judged, and categorized, by one thing: the number on their license plate. Paris is number 75, and if you drive anywhere else in France, aside from your black clothing, the chain-smoking, and the mad tapping on your iPhone, you’re pegged as a Parisian if your license plate ends with the oft-feared soixante-quinze. Parisians have a bit of a reputation in les autres départements and as we drove home from dinner one night when I was in the Poitou-Charente on vacation, a typical French family attempting to cross the street retracted when they saw our car approaching; “Il n’a rien vu les autres, le Parisien!” (“He doesn’t see others, the Parisian!”) shouted the father, frantically pushing his beloved a safe distance from les soixante-quinzes. And sure enough, the driver of our car floored it past the French family, who wisely kept their distance, and were left in a cloud of diesel fumes as we sped past. Another thing that some find vexing, which a few French friends pointed out, was that in The Sweet Life in Paris, I had the temerity to make up a word: bousculer. I didn’t realize that making up a word was going to cause such a reaction—”It is just not done!” I’ve been told. And considering the many times as I’ve tried to explain what a “staycation” or a “breastaurant” was, I guess I shouldn’t be surprised to find their dismay when someone runs so loose with their language. My friend Jackie may not consider herself a bousculeur (or heaven forbid, bousculeuse), but when I mentioned le resquillage, she didn’t bristle a bit. 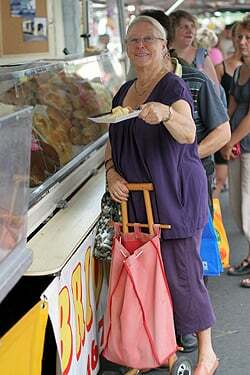 Navigating the markets of Paris all her life, she’s a pro at avoiding waiting in line. For example, when we walked into the jam-packed supermarket in her village, the butcher counter was, like, five-people deep with folks anxious to get something for their weekend meal. 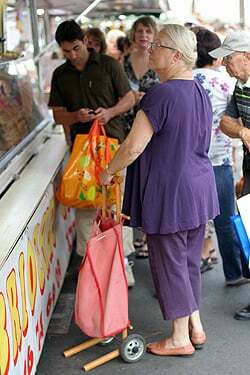 Jackie saw an opening, interrupted the salesgirl in mid-order, and told her she wanted to speak to the butcher. Like Moses parting the Red Sea, out came the butcher to have a word with her about her upcoming order. Like most Parisian women, she wouldn’t dream of hitting the market without her chariot, which is the French equivalent of the sport-utility vehicle. When I lived in San Francisco, at any of the myriad of four-way stop signs, the one who got to go first after the stop wasn’t the one who had arrived first; it was the largest vehicle at the intersection who would floor it regardless of whose turn it was. And heaven help you if you were in a Mini Cooper and confronted with a pony-tailed, spandex-wearing woman in a Range Rover who was late for her yoga class. Even les soixante-quinzes would dodge out of the way for her. Notice how at the counter Jackie steps forward and positions herself, and the rolling cart where no one can step into that space. As her husband insisted when she is driving behind someone else: “Collez! Collez!”, or “Stick! Stick!”, since he rightly knows that if you leave four centimeters of space between you and the car in front of you, someone is bound to try to wedge in there. At the market, the same rule applies. But she is having none of that, and as you can see, after firmly guarding her place—voilà! She’s scored her purchase and is ready to hit the next stand. Aside from how to successfully maneuver a French market, and terrorize the locals, Jackie also taught me a new phrase: Au pif, which means cooking “by the nose.” As I’d mentioned before, some Americans have trouble with French recipes since they’re often less-precise because one is expected to tackle the recipe au pif. Her signature Sauce Gribiche is a good case in point. The recipe in the book that she follows calls for “4 or 5 capers“…for four servings. When I questioned what kind of kooky recipe parsons out one dinky caper per person, she waved me away with a knowing laugh—“Au pif, Daveed!” In the way of a Frenchwoman, one doesn’t necessarily need to follow the rules all that carefully. 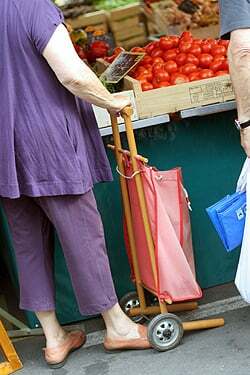 And the one rule I’m following toujours is to stay out of her way at the market, which is something I’ve learned au pif. This is a fantastic sauce and is one of those stand-bys that you can make when you don’t think you have anything on hand. 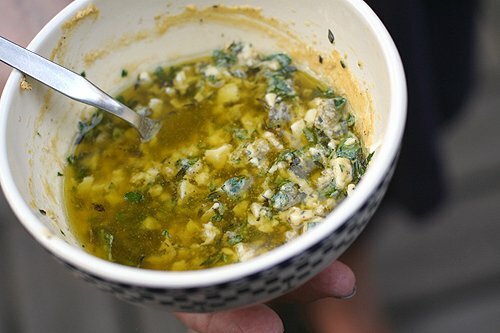 If you keep a jar of capers and one of cornichons (gherkins) in the refrigerator, along with a some herbs, you can make this pretty easily.Traditionally sauce gribiche is served over tête de veau, boiled veal head, which is something I’ve yet to try. (And I’m not dying to, either.) 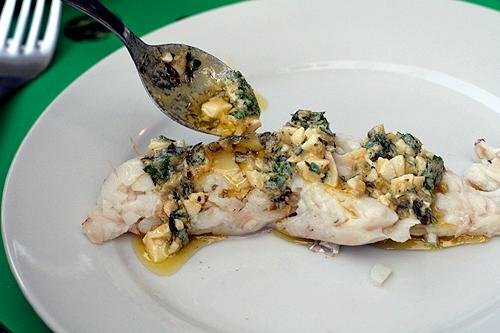 But it makes a simple piece fish, like the merlu (hake) Jackie poached, into something special. 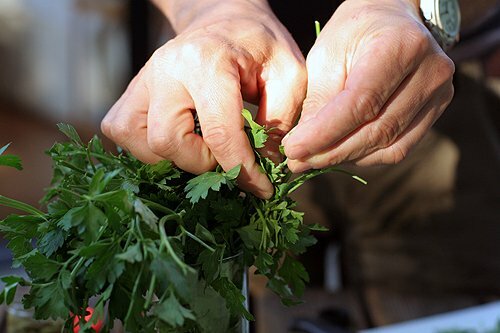 It can also be spooned over halves of hard-cooked eggs or steamed asparagus.The recipe also calls for using a bunch of herbs, but Jackie said it’s best with just one: parsley. Being contrary, I like to use a mix. And when I suggested chopping the capers to distribute them more easily, she looked as if I suggested that she wait at the end of the line at the butcher. Still, in your kitchen, feel free to adjust the recipe—au pif. 1. Cook the egg in boiling water for 10 minutes. Remove from heat, drain away the water, and cool the egg by adding ice and cold water to the pot. 2. Once cool, peel the egg then extract the yolk. In a medium-sized bowl, mash the yolk until smooth with the mustard. 3. 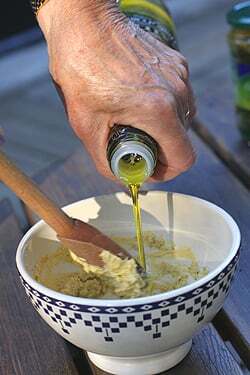 Dribble in the olive oil, beating with a fork or wooden spoon while doing so (trying to make an emulsion), then adding the vinegar. 4. Chop the egg white and cornichon separately into fine cubes, the size of the capers, and add them to the sauce. Then add the capers themselves. 5. Stir in the herbs and add salt and pepper. Taste, and season with additional salt, pepper, and vinegar, if necessary. Serve at room temperature. 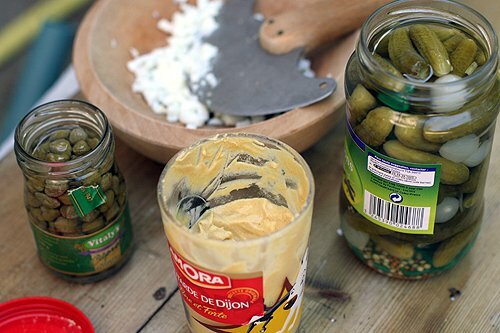 Storage: The sauce gribiche, can be made up to one day ahead and refrigerated. *Her recipe calls for un verre (one glass) of olive oil. And when I asked what that was on behalf of you, my readers, she waved me away, tapping the side of her nose. “Au pif, Daveed!” But it looked to me to be about one-third of a cup. 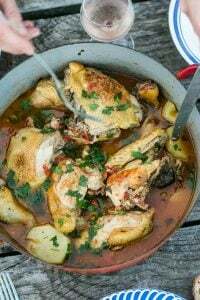 You can add more or less to make the sauce the consistency that you want. That is one sick chariot she’s got. It’s like the Mad Max of chariots – with like wooden flame-throwers out front. Awesome. Maybe the recipe in the book meant 4 or 5 caper *berries*? The olive-sized ones that you would then want to chop? Cuz’ I agree with you, who could even taste 5 tiny capers in that all that sauce. Which sounds delicious by the way, I’m thinking about what the other vegetarian applications might be. I love this story! :) The sauce sounds delicious. Thank you for sharing, David! I noticed that it’s served with fish but I wonder what else it could be served with. I guess I’ll just have to figure that out “au pif”. :) May be it would go nicely with potatoes. She looks like the lady who ran over my foot with her shopping cart and then looked at me like it was my fault for not getting out of her way. I’ve never tried this sauce but it sure does look good. This explains so much about my mother. She’s originally from Paris, but is now living in Los Angeles. 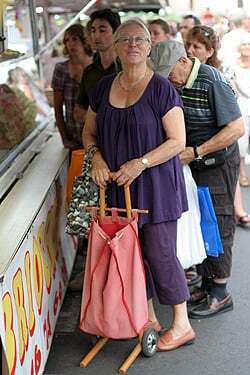 When we went to Europe, she taught us that pedestrians do not have the right of way there. It’s also impossible to get a recipe from her. She puts a little of this and a little of that in the recipe and cannot remember what exactly even an hour after making it. I’ve learned to live with it. I remember that I’ve written something here about “Au pif” and french nose related sayings. There’s two different meanings : Au pif means “totally randomly”. But avoir du pif means “being really good at guessing with clever instincts, knowing how to analyse and to pick the good answer”. => this cake is way better, it was a good idea to add some vanilla. Tu as eu du pif ! (it’s a choice you made, thinking it was clever… and it was). Maybe I do not get the sentence, but bousculer exists in french, you’re right to use it. bousculeur is perfect french too, even some litterature colloques use it on their titles. That’s one scary looking fish. *shudder* C’est quoi, ça? That is a fantastic story! When you roared past that family did you by chance wave a friendly “sorry” out the window? It would then become the ultimate dreaded car. Rude Parisian driver, annoyingly friendly American passenger. I had to laugh at the description of Parisian drivers. I lived in Boston for almost five years and couldn’t imagine drivers any more crazy than that. I think Bostonians are considered so bad, some insurance companies don’t even cover drivers from Massachusetts. However, I never received a look of fear or shock or horror when driving my “MA” emblazoned plated car around the country – mostly New England and New York. I do remember pedestrians were just as bad in Boston. Boldly going where no pedestrian shouldn’t go. I don’t remember that fear of life in Paris. But perhaps I was oblivious! I shall keep a watchful eye, next time! I love the phrase Au pif. It’s like someone musical playing by ear – which is demonstration of much skill. Wonderful! La Rêveuse: She told me is was merlu, which I believe is hake in English. 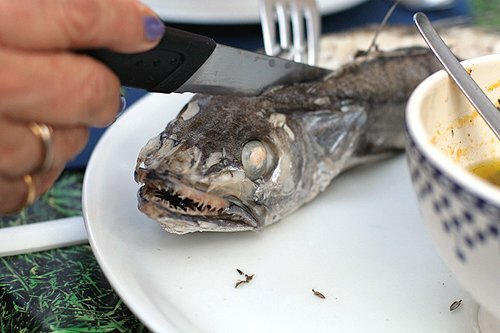 It tasted quite good (in spite of it’s scary expression) and it was locally fished, and is on my responsable seafood guide as a-ok to eat, too! Krysalia: I think they’re just miffed (un peu en colère) that I pointed that out. As for restaurants on the site, I don’t do ‘reviews’ since I generally just like to point readers toward places that I like and think they might, too. Sheila: It’s funny, because I was in Lyon all day and everyone kept moving out of other’s way on the streets and sidewalks. Then, when we got back to the gare de Lyon in Paris, like four people slammed into me. Welcome home! Julia- I am a Bostonian living here in Paris for a bit and the funny thing is that I am not at all alarmed by the driving. I am used to cars flooring it around the city and screaming to a halt at a red light. I am also used to taking my life in my own hands when crossing the street for fear of a rogue vehicle shooting out from somewhere unexpected. Its the people on the sidewalks that have put a bee in my bonnet. Bostonians don’t crash into each other like the Parisians. Oh it is driving me nuts! Plus I am dragging two children around the city with me so we seem to cast a wide net for people who don’t care to watch where they are going. Her chariot is really cool! And dangerous! Maybe if I had the same one, les autres ne me bousculuraient pas autant… Where did she buy it? Ahhh, “au pif”, what a perfect expression. Now to work on my pronounciation of “au” so I can sling it about willy nilly. Jacques Pepin serves gribiche over steamed cauliflower…for your vegetarian reader, Michael (though he adds a few anchovy fillets). And I had an insanely delicious gribiche over pigs feet in the south of france, in a dinner recapped here: http://tinyurl.com/nnv3cf. Thanks for the reminder! As much as I love tete and pieds, I’ll be giving it a whirl over a bone-in pork chop. I confess. Sometimes I come here just for the stories. And the fish-face photo? Well, Edward Gorey and Tim Burton have nothing on you David. Gribiche has been one of my favorites since I discovered it via Patricia Wells! The sauce sounds wonderful and I’d like to try it. 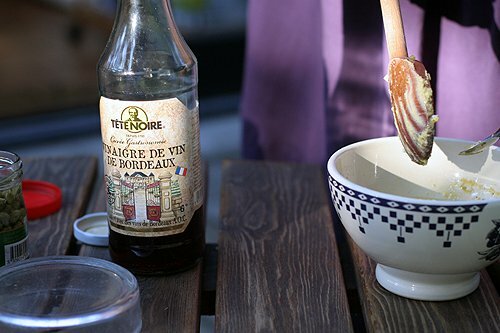 I have observed the making of an emulsion that uses vinegar and oil and the oil was whisked in vigorously at the end of the process, even when using stablizers like eggs and/or dijon. Does it matter or have I been watching too much food network? So true about the 75 on the license plate, my grandparents lived in Paris for as long as I knew them and I remember the comments about it when we would drive out of the city. I was in Paris recently and did not notice Parisians crashing into me on the sidewalk, maybe I was just avoiding them pre-emptively. The recipes here are fantastic, photos exquisite, but I really have to second the above comment about coming here for the stories. They are the icing on the cake (or the sauce gribiche on the hake)! Ooh lala, matching purple nail polish…. Wow! I am so excited to finally have a recipe for Jackie’s Sauce Gribiche. Delicious. It is wonderful on poached salmon too. Now, can you get her to offer up her recipe for Apple Crumble? That is one scary looking fish!!! It would put me off eating it. I love your emails and really enjoy reading about your adventures. Keep all that good stuff coming. PS I think I told you before that your latest cookbook was very good reading. I think I am now the master of au pif cooking, having successfully baked a lovely holey and light ciabatta based on 5 different internet recipes, but following none. I couldn’t tell you how I did it, but I am so glad that I did! Thank you for all the wonderful stories about Paris! I love this story…and I love this woman. I also love that you have the nerve to make up words and use them. Bravo to you! P.S. As of now, I will no longer refer to my little old car as a clunker. When I wheel my friends around in the jalopy I will tell them we are riding in my chariot. lol. :) Oh how i love the sound of that! I love gribiche sauce. Particularly with white fish. I also find it to be very good with steamed leeks. Thanks for reminding me! I’m wondering if your friend’s recipe comes from “Les recettes faciles” by Françoise Bernard? At least I remember that recipe to call for 4 or 5 capers. In Norway, lots of people use powdered sauces, which is a shame given that there are so many great sauces that one can throw together from scratch without much effort: salsas of all sorts, pesto, aïoli, romesco, baba ghanoush, béchamel-based sauces, tzatziki, horseradish cream, tapenade, etc, etc. Fun to read this post after just getting back from the market – with my chariot bien sur. And I have to say, I have been battling with that phrase “au pif” for the past 10 years… trying to get recipes from my French mother-in-law is quite the challenge…! Tete de veau is absolutely fabulous. Just close your eyes when you first eat it. I am French living in NYC. I was raised in Paris from the dreaded “75”. One thing Parisians hate when they traveled outside of their “turf” is to be called “conges payes” (“paid vacationers”, I guess will be the translation in English). Both my mother and grandmothers were great cooks and all my mother will tell me when showing me her recipes if I asked her “Combien?” was “Tu vois” (You see or You figure out). Actually I found recipes for Americans a little bit infantile. Is it really important to write 1/2 tsp salt instead of just salt? 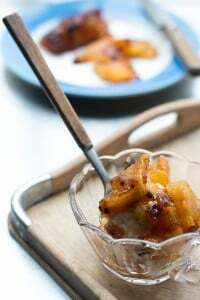 The “tu vois” or “au pif” recipes give the cook freedom to be creative. David, I think you have become French in that regard. Josee: Yes, some recipes are too-precise, but as someone who deals frequently with copyeditors, who ask questions on behalf of readers, such as, “When you say ‘chill’, do you mean in the refrigerator?” And an ex-editor of mine recently pointed out that I had a recipe for a spread on the site that called for “half a bunch of chives”, and that I should say what the amount is. Whew! I often wish people would take a deep breath before going into the kitchen and relax. 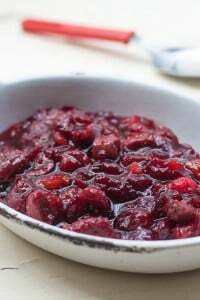 Most things, such as this sauce, can be made using the recipe as a guideline. If people drove as carefully as they felt they needed to follow recipes, there’d be a lot less accidents! David, your friend Jackie sounds so cool! Never mind the head of the fish, is that purple nail polish to match her outfit?! I’d kill to run into the two of you at the market. I got a recipe for a chickpea salad and also a cauliflower and tomato pesto salad from a caterer recently. She listed the ingredients and said to add the ingredients together until they tasted the way I wanted. It’s a great way to cook! the comment about the license plates is so true ! but generally speaking parisians are always hated in the rest of the country. but as a 75 myself, I like being part of this game. as you may know, a while ago the european parliament reformed the license plates system for all european countries – i think – and then forced france to drop the department numbers on french license plates. as a response more than TWO HUNDRED (out of 600, which is a very big ratio comparing to the usual deputees’ attendance at the assembly) french deputees fought back and managed somehow to keep this highly important piece of information on license plates. it was a deeply ridiculous fight especially regarding the other political issues at that time but hey, i think it relieved everyone, 75 or not 75. I am Colombian but have lived both in Europe and Usa, I have been reading your blog with great pleasure, it has made me miss Europe too. 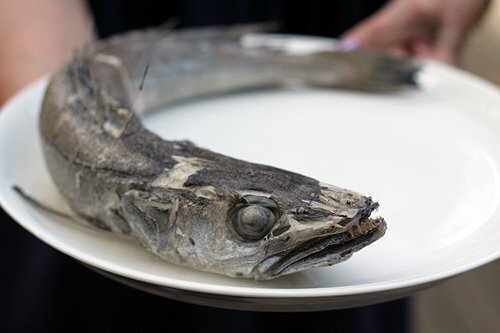 The sauce sounds really good, but I have to say that is one scary looking fish! Sounds like the sidewalks are not safe, either! Quite the little culture clash within France! FABULOUS knife through head of fish pic. I make my cocktail sauce similarly; I add the horseradish until it smells right. It drives my friends crazy when they want the recipe. I find precise recipes are handy when you want to set a base point for experimentation, a reference so you know when future experimentation is working as well as one might hope. P.S. I had a long and rather exciting dream about black truffles and foie gras. I think I may be going odd. david said> Krysalia: I don’t do ‘reviews’ since I generally just like to point readers toward places that I like and think they might, too. I think reviews was not the good word, but I did not have a more precise english equivalent in mind, i have a lack of vocabulary sometimes*. Ce que je voulais dire, c’est que lorsque vous parlez des restaurants que vous aimez, c’est dans des termes très différents de ce qu’aurait indiqué un français à un autre français pour lui faire comprendre ce que l’établissement avait de spécial. Les éléments significatifs ne sont pas les mêmes, et c’est amusant pour moi qui aime décortiquer ma langue et nos usages : ça me fait découvrir cette manie que nous avons, les français, de tout ramener aux différences entre les régions. Je l’ai vu parce que justement j’ai senti ce manque dans ce texte ou elles n’étaient pas présentes. hmm… sometimes english language is so frustrating :) . I bet you see what I mean when you think about french. I love how she’s rockin’ the nail polish, but that is seriously the most freaking hideous fish I’ve ever laid eyes on. What IS it? Greetings from one American ex-pat to another . . . I’ve been living in Belgium for the past ten years. 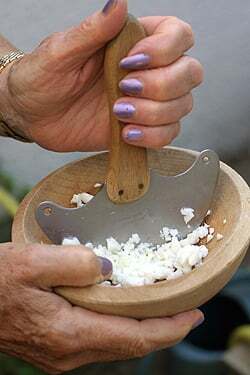 Curious to know what the name, in French, is of the utensil pictured that looks like it is half mezzaluna/half mortar and pestle, if you know it. I saw one for the first time today in the window of a cutlery shop in Brussels, but the shop was closed for lunch. Just recently discovered your blog, really enjoy it! Thanks. She must have lovable traits, because she is the kind of shopper I ram with my cart whenever I think I can get away with it. You know the one who leaves her veg on the scale while she goes and gets another so no one else can use it? The one who talks to her neighbor cart beside cart in the center so no one can pass And yes, of course, the one who thinks la coda doesn’t mean for her. It’s why I frequently shop at lunchtime when everyone else is at home eating. Here in the rolling farmlands of Wisconsin we’re edging towards the beginning of apple season. Do you have any plans for a blog entry re: apples? Could you, please? I love your work! David, I just started reading The Sweet Life in Paris. I love Paris and have a small home there (VI ieme). However I am writing because I love your descriptions of life in the bay area and Chez Panisse. We lived in San Francisco and then Lafayette from 1969 until 1990 and we remember the early days of Chez Panisse. To help the mood I opened a 1980 Duckhorn Cabernet which is still delightful. Perhaps our paths will cross someday. Proust was notorious for making up words. Coiffure becoming coiffage, etc. Don’t let those ‘Le Trésor de la Langue Française’ types cramp your style, D.Leb! When I was in Spain working for a few months, I saw that fish in the market in Mallorca…and the fish man had it set up with its mouth wide open! Truly scary looking. I think even the other dead fish were afraid of it. But it is so very delicate in flavor, the fear factor can be overcome. And with that sauce on it…what do a few (dozen) razor sharp teeth matter? i hate to be a nay-sayer, but i can’t help say the sauce looks broken to me. is it not supposed be nicely emulsified like a mayonnaise? I believe there are different kinds of sauce gribiche. If you want it more emulsified, you could beat more with the fork or add more mustard…au pif!